Lake Waukewan and Winona Lake’s watershed encompasses approximately 13 square miles of forested and developed land area including three ponds, eight tributaries and various wetlands. GENERAL DESCRIPTION: The Lake Waukewan and Winona Lake watershed covers approximately 8,300 acres or 13 square miles of forested and developed land in Belknap and Grafton Counties. 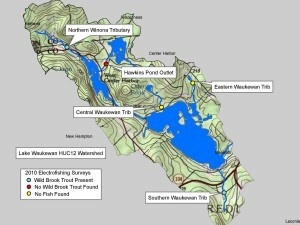 The watershed, which is part of the larger Lake Winnipesaukee watershed, includes portions of five towns: Meredith, New Hampton, Center Harbor, Holderness, and Ashland, New Hampshire. Watershed boundary data was obtained from GRANIT, the New Hampshire GIS clearinghouse maintained by the University of New Hampshire. 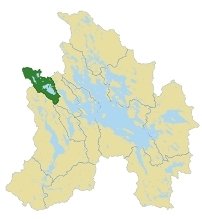 The Watershed boundaries were edited to accommodate the goals of the Lake Loading Response Model (LLRM) and the watershed restoration plan. Communities: Thirty-three percent (33%) of the watershed area lies within the town of Meredith, followed closely by Center Harbor and New Hampton at 29% and 24% respectively. The small land area of Ashland and Holderness that lies within the watershed is characterized by forested and agricultural land. Seventy-nine percent (79%) of the land area that lies within Ashland’s town boundary is in conservation, which is important as the headwaters to Lake Winona are located here. 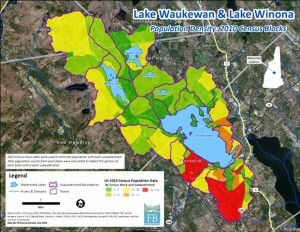 Population and Growth Trends: The Lake Waukewan and Winona watershed is moderately developed with urban and concentrated residential development located mostly in the southern portion of the watershed in the Town of Meredith, NH. Population trends between 2000 and 2010 census data show an increase in population in all five watershed communities (NH Office of Energy & Planning, 2013). An increase in population often leads to increases in developed land which may lead to increased stormwater pollution if not properly planned and managed. Population density in the study area, by US Census (2010) block, calculated for each sub-watershed. Climate: Climate in the lakes region of New Hampshire is considered continental due to prevailing westerly winds, and highly variable due to the mid latitude location. Four distinct seasons are experienced with wide ranges in both daily and annual temperatures. Due to this factor the lakes are dimictic, turning over twice each year, once in the spring, and again in the fall, and will stratify during the summer months. Precipitation for the area is calculated from long-term climate data from several weather stations near the watershed. A weighted yearly precipitation total, based on geographical positioning of the weather stations that compensates for local weather patterns, is calculated at 48.65 inches (1.24 m) for input in the current Lake Load Response Model (LLRM). Soils: The mixture or composition of soil components (clay, loam, sand, silt) impacts the ability of the soil to infiltrate water, and thus reduce runoff. The USDA Natural Resource Conservation Service (NRCS) groups soils into four main hydrologic soil categories (A, B, C, D) based on estimates of runoff potential (U.S.D.A Natural Resource Conservation Service, 2007). The majority of soils in Belknap County fall within Hydrologic Soil Group C. Group C soils have a slow infiltration rate when thoroughly wet and therefore a moderately high runoff potential. These consist chiefly of soils having a layer that impedes the downward movement of water or soils of moderately fine texture or fine texture. Water transmission through the soil is somewhat restricted. Group C soils typically have between 20 to 40 percent clay and less than 50 percent sand and have loam, silt loam, sandy clay loam, clay loam, and silty clay loam textures (U.S.D.A Natural Resource Conservation Service, 2007). Ponds and Streams: In addition to Lake Waukewan and Winona Lake, the watershed also includes eight tributaries, various wetlands, and three small ponds: Hawkins Pond, Bear Pond, and Otter Pond. Otter Pond flows to a tributary that empties directly into Lake Waukewan. Bear Pond flows into Hawkins Pond which then flows into Winona Lake. Fisheries: Lake Waukewan and Winona provide excellent habitat for a variety of cold and warm water fisheries. Lake Waukewan is classified as both a coldwater and warm water fishery by the NH Fish and Game Department and contains stocked rainbow trout, smallmouth bass, chain pickerel, horned pout and white perch among other species. Lake Winona is classified as a coldwater fishery and provides habitat for both rainbow trout and brook trout. However, Lake Winona also has a warm water fishery component and contains large and small mouth bass (NHF&G Dept., 2012). Both lakes and the various streams located within the watershed are valued for their beauty, recreational opportunities, ecological richness, and contribution to the local economy. A summary of the fish surveys of the major tributaries to Lake Winona and Lake Waukewan conducted in June 2010 by the NH Fish and Game Department can be found in Appendix C.
For more information regarding the soils, wetlands, streams and tributaries in the Waukewan Watershed please refer to the 2005 Management Plan for the Waukewan Watershed. In order to determine drainage flow and assess pollutant load, the Waukewan watershed was delineated into subwatersheds, including separated drainage areas for Lake Winona. 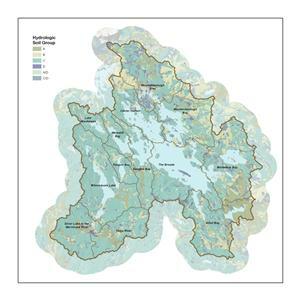 Watershed boundary data obtained from the Lake Winnipesaukee Association (LWA) were edited to accommodate the goals of the LLRM and the watershed restoration plan. 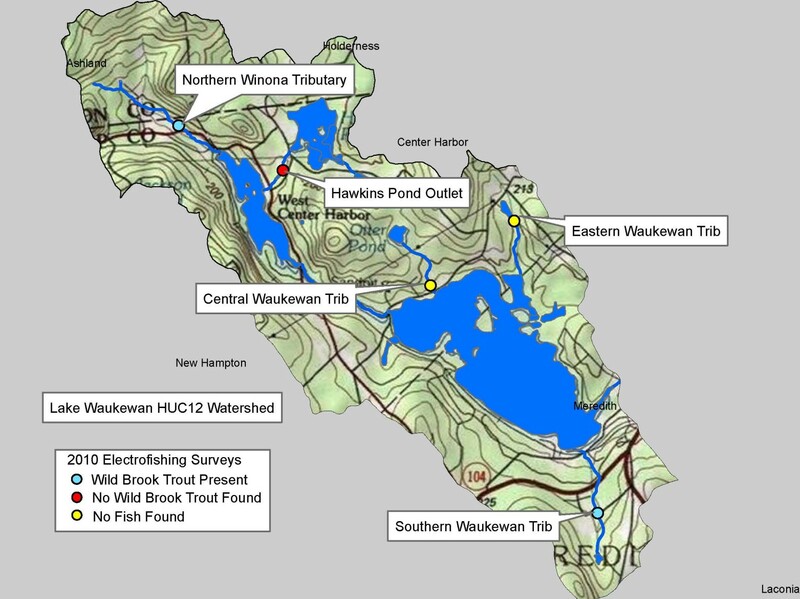 Further watershed delineations were made using digital topographic maps and the digital elevation model (DEM) obtained from GRANIT, the New Hampshire GIS clearinghouse maintained by the University of New Hampshire. 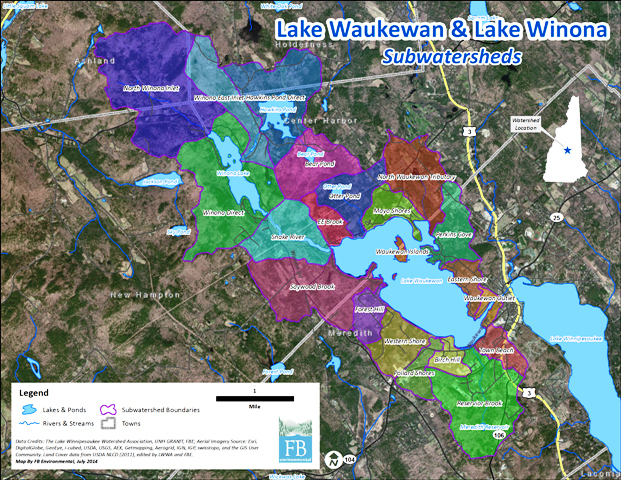 A total of twenty-one (21) subwatersheds were delineated; five (5) for the Lake Winona watershed and sixteen (16) subwatersheds which drain directly to Lake Waukewan. The Snake River subwatershed receives drainage from the five Lake Winona subwatersheds through the outlet of Lake Winona and therefore is the largest source of water inflow to Lake Waukewan. Land cover data is used to estimate the transport and retention patterns of phosphorus as it moves through a watershed. Land cover data (NLCD 2011) for the study area has been verified and edited as necessary using current aerial imagery. 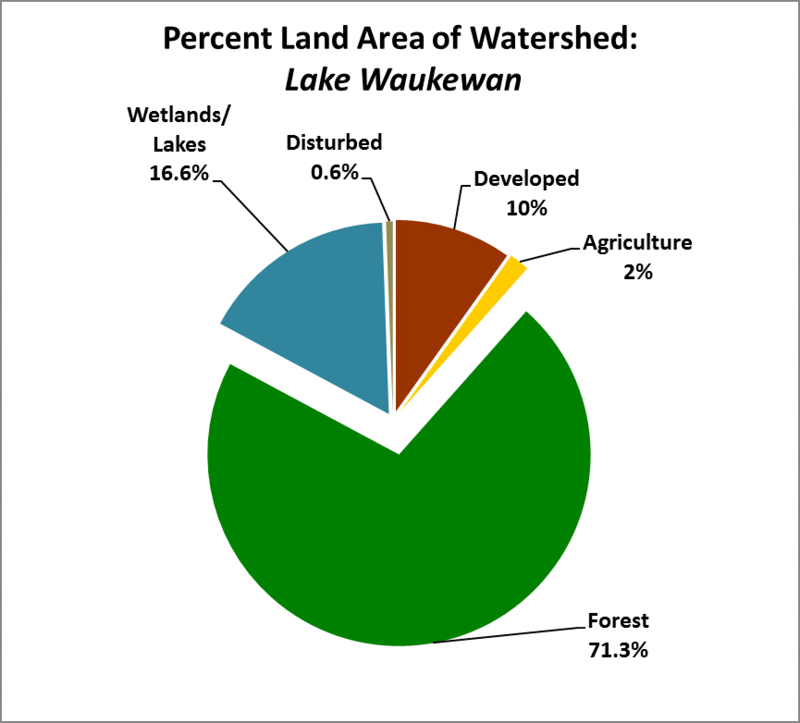 Forested land is the predominant land cover in both the Lake Waukewan and Winona Lake watersheds at 71% and 86% respectively. Lakes, ponds, and wetlands comprise the second largest land cover in both watersheds, with developed land area coming in third. 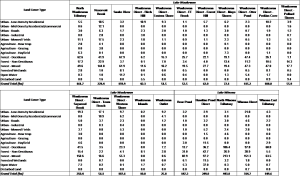 Land use data for the individual subwatersheds is shown in the table below. Note that the land areas for the Waukewan watershed include Winona’s watershed area. Land Cover in the study area (NLCD 2011, with edits by LWA and FBE). 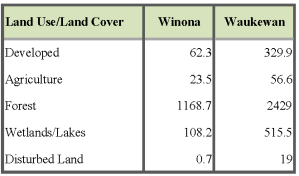 Land cover statistics for subwatersheds in the study watershed. Data are in hectares (1 hectare = 2.47 acres). Note: Open Water category does not include area for Lake Waukewan or Lake Winona. 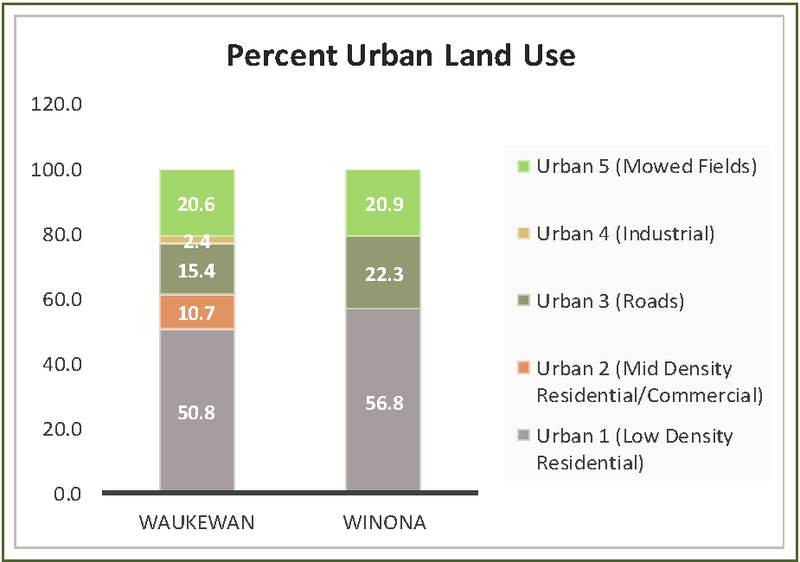 A breakdown of the ‘Developed’ portion of the land area indicates low density residential land use makes up the largest land use in each watershed at 56.8 % in Winona and 50.8% in the Waukewan watershed. 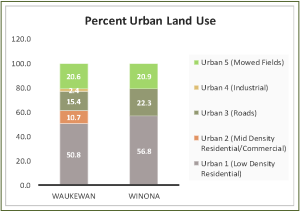 Mowed fields is the second largest category (20.6%) in the Waukewan watershed followed by the road network; whereas, the road network makes up the second largest urban category in the Lake Winona watershed, followed closely by mowed fields. 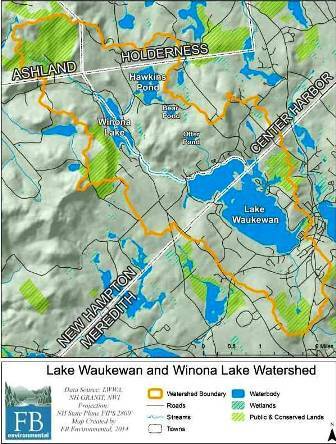 As mentioned previously, land areas for the Waukewan watershed include Lake Winona’s watershed area. 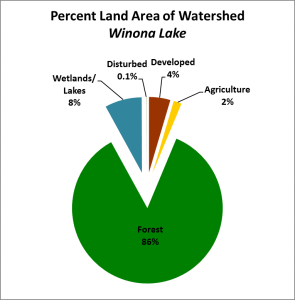 There is no industrial or mid-density residential/commercial land use in the Lake Winona watershed.